A treasure hunt in your own neighborhood! This two-day printmaking workshop is inspired by tourist brochures and information maps found around Hobart. 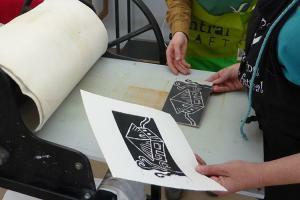 Discover printmaking and the field of cartography (map making) with tutors Phoebe Beard and Florence Robinson. At the end of the workshop, take home your own series of “X Marks the Spot” prints!